Ahead of the Nov. 6 mid-term elections and in conjunction with National Voter Registration Day (Sept. 25), Nikkei Progressives have been holding a series of voter registration drives at such venues as Little Tokyo Towers, Japanese Village Plaza, Tuesday Night Café at Union Center for the Arts, and FandangObon at the Japanese American Cultural and Community Center. 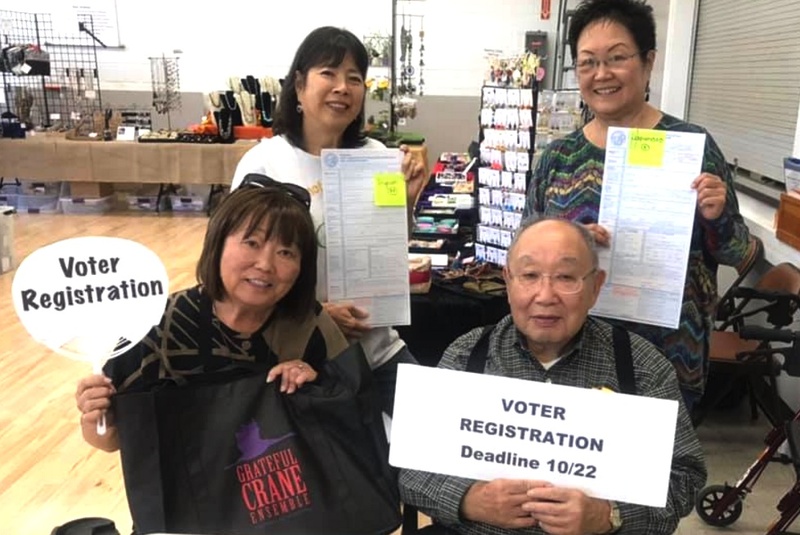 Pictured are (clockwise from top left) June Hibino, Jan Tokumaru, Kanji Sahara and Carrie Morita at Gardena Valley Japanese Cultural Institute’s Kansha Craft Show on Sept. 30. The group will also have a table at the next Tuesday Night Café on Oct. 16. The deadline to register for the next election is Oct. 22. GOTV (get out the vote) activities in Orange County are also planned.